The following is from the Aloha Stadium website and I've included the most current information (as of 11.7.2018). **limited seats are on sale for each night! Below is important information to make your concert experience a once in a lifetime event! All shows have LIMITED SEATS FOR SALE NOW (11.8.2018). Around the stadium, HEAVY TRAFFIC, congested streets are likely for this highly anticipated performance. The venue has limited parking available on-site and we expect that it will sell out fast. Only cars that have concert tickets will be allowed in the gates. Cars that are not able to provide concert tickets will be turned away. For your convenience, we STRONGLY URGE you to come in early, use share ride services, utilize alternate sites and to carpool when possible. Aloha Stadium has limited on-site parking and will sell out fast. Only cars that have concert tickets will be allowed in the gates. Tailgating is NOT allowed for concert events. ADA Parking: Please use the Main Salt Lake Stadium Entrance. Limited stalls available at parking sections 2AB, 3B, 6A, and 13A. Electric Vehicle Parking: Limited free parking available on a first come first serve basis. ***Note that the Honolulu Police Department (HPD) will be assisting with traffic flow on surface streets around the stadium. Additionally, HPD may do intermittent exit closures at the Aiea cut-off and the Halawa/Stadium exits on H-1 Eastbound if the freeway begins to back-up. If you encounter a closed exit, please proceed to the next available exit, and if necessary, do a U-turn and make your way back to the stadium. RIDE SHARE OR DROP OFF A convenient drop-off and pick-up zone is available along Kaimakani Street (next to Aiea Elementary School – see map). Use the adjacent pedestrian bridge for easy access onto stadium property. This drop zone is also open for limos, party buses and charters. 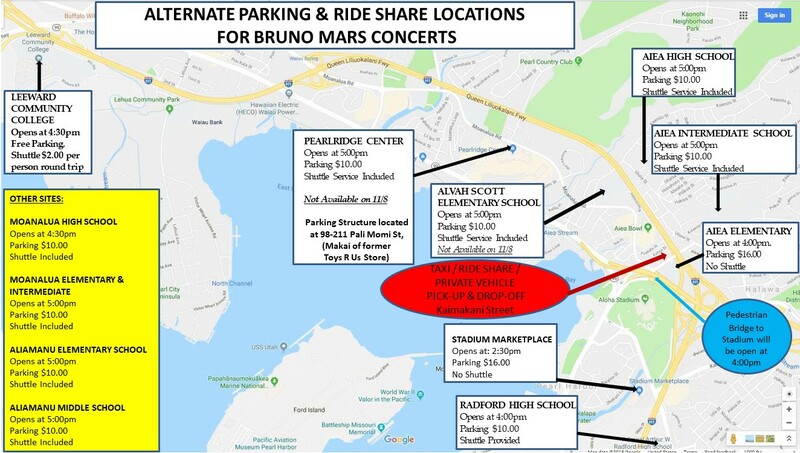 ALTERNATE PARKING SITES We have arranged for multiple off-site parking options (see map), some within walking distance and many with convenient shuttles, to get you directly to the stadium before the concert and back to your car following the concert. Your safety is our top priority. In addition to already existing measures, we have implemented new security features to enhance the safety and overall concert experience for everyone. All ticket holders will be screened prior to entry at the turnstile gates. Screening will include a bag check and metal detection. Please give yourself ample time to get to your seats. Each person shall be allowed one bag that does not exceed 12” x 6” x 12” in size. In addition, each person will be allowed to hand-carry a blanket, poncho or jacket, along with a soft-sided seat cushion. Exceptions will only be made for medically necessary items, after proper inspection. Non-approved bags must be returned to vehicle or discarded. Strollers are allowed, however they must be collapsible and fit underneath the seat and stored safely without obstructing the aisle-ways for other guests. All bags, jackets, guests and vehicles are subject to search upon entering the premises. Express lanes are available at each turnstile gate for persons without bags. IMPORTANT NOTE: VIOLATORS ARE SUBJECT TO THE PROVISIONS OF STATE LAW AND EJECTION FROM THE ALOHA STADIUM PROPERTY. RESTRICTED ITEMS The following items are PROHIBITED from entering the Aloha Stadium turnstiles: Weapons; Noise Makers; Illegal Drugs; Cans & Bottles; Umbrellas; Coolers; Fireworks; Outside Food & Beverages (Snack Leis permissible, but must be pre-made with each item measuring no larger than 4” x 4” x 2”, and no liquids); Inflatable objects of any kind; Confetti; Balloons; Lasers; Poles & Sticks; Skateboards; rollerblades; Bicycles; Animals (except ADA-Compliant Service Animals); motorized remote controlled devices (including drones); or any items which may pose a health or safety issue to our guests and employees. BANNERS/SIGNS Will be allowed, however they must be made of paper or soft fabric that can be rolled up. Cannot be affixed to the stadium or obstruct the view of other guests. SMOKING Smoking is prohibited except within a posted designated smoking area. (this includes vapor and electronic cigarettes). Violators are subject to removal. Smoking in any other areas could lead to arrest, and this would be considered a misdemeanor. FIELD ACCESS Guests with field tickets are required to wear wristbands. Wristbands may be found on the mauka and makai pavilion entrance Sections F and FF on the ground level. Use Stadium service road to access. SEATING Aloha Stadium patrons are responsible for their own conduct as well as the conduct of their guests and/or persons using their tickets. Stadium staff will strive to maintain an atmosphere where all in attendance can enjoy the concert/performance. Event patrons and guests in violation of the Guest Code of Conduct may be subject to ejection, arrest, and/or loss of ticket privileges for future events. Please arrive with enough time to enter the stadium with the anticipation of long lines and everyone arriving at the same time. Please be courteous and respectful to those seated around you and refrain from behavior that interferes with others’ ability to enjoy the event. Remember that every attendee wants to enjoy this event, not just you. Similarly, stadium personnel strive to treat all guests in a consistent, professional and courteous manner. If the behavior of a patron or patrons around you becomes disruptive or violates the Guest Code of Conduct, the incident should be reported to the nearest usher or security person. To report an incident discreetly during an event, a text can be placed to the Security Office using the keyword ALOHA to 78247 to report activity and location. You may also call the Stadium Security Hotline at 483-2807. Will weather be a factor?A. All concerts are held rain or shine. Please be aware that umbrellas are not allowed inside the stadium. Visit our prohibited items for details. What if I have a will-call ticket?A. Box office will be open for will call tickets only. They will not have access to any other tickets. Will there be portables and food sold on the field?A. Yes, there will be portables and food sales in the Bridge Storage Areas adjacent to south end zone. What time will Turnstile Gates open for the concert? A. All turnstiles will open to the public starting at 5:30pm. What if I have special items I need to bring in?A. Exceptions will only be made for medically necessary items, after proper inspection. For other items please contact our Security Office(808) 483-2807 prior to event date. What are the payment types accepted? A. The Aloha Stadium recommends bringing cash. Parking, and several concessions are cash only. There will be limited number of ATMs available and guests should expect lines at the ATM’s. Will Swap Meet be open on concert day?A. Yes, there will be a modified swap meet in sections 8-14 from 8:00am – 1:30pm on Saturday, November 10th and Sunday, November 11th. *Parking lot will be cleared after swap meet closes. Any cars remaining will be towed prior to gates reopening at 4:00pm.